The year is 1955. Twenty-year-old Masayo, an aspiring painter from Hakodate, apprentices herself to Goro Kawabuko, a handsome widower who teaches at a Tokyo art college. In exchange for a weekly lesson, Masayo agrees to keep house for Goro and tutor his daughter Momoko, a strange, withdrawn child whose only companion is a regal white cat named Lala. Masayo, who comes from a humble background, finds the Kawabuko household enchanting. Or, more accurately, she finds Goro enchanting. Goro epitomizes urban chic, hosting lavish parties, listening to jazz, and wearing the latest Western fashions. Realizing that Goro is beyond her reach, Masayo instead focuses on Momoko; if she can gain the girl’s confidance, perhaps she’ll have a claim on Goro’s heart as well. Masayo must first demonstrate her affinity for Lala, however, as the cat exerts an almost maternal power over Momoko, responding to her mistress’ quicksilver moods with an emotional intelligence that borders on human. For a wicked moment, I savored the momentary discomfiture that flickered across the faces of Goro and Chinatsu. Momoko had shown precious little interest in Chintasu; indeed, she had all but ignored her. And then she came running to me. It occurred to me then that aside from Goro, nobody was closer to Momoko than I was. That thought made me feel even more elated. Like Henry James’s “The Turn of the Screw,” The Cat in the Coffin draws its power from “the strange and sinister embroidered on the very type of the normal and easy,” presenting itself as a domestic drama about a naive young woman who falls for her worldly employer. Yet the book has an oppressive, eerie quality that lends itself to several tantalizing readings: that Lala may be possessed by Momoko’s dead mother, that Momoko herself is a bad seed. By the novel’s end, the reader may believe Masayo’s account of events — and even feel great compassion for her — while questioning her involvement in them. It’s this level of narrative complexity that elevates The Cat in the Coffin from romantic pot boiler to literature: we’re seduced by Masayo’s modest, self-effacing comments before we recognize that she’s an unreliable witness. One can certainly read The Cat in the Coffin as an atmospheric mystery, but it works on many other levels as well: as a meditation on jealousy, as a young woman’s sexual awakening, as a portrait of life in occupied Japan, as a parody of the Victorian governess novel. I’d love to see Vertical translate more work by Mariko Koike, as she brings an uncommon level of wisdom and literary sophistication to a pulpy genre. Review copy provided by Vertical, Inc. 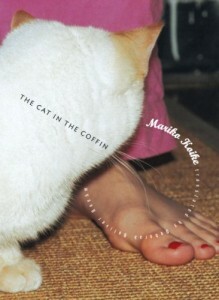 THE CAT IN THE COFFIN • BY MARIKO KOIKE, TRANSLATED BY DEBORAH BOLIVER BOEHM • VERTICAL, INC. • 190 pp.